Amazon.com Price: $17.42 (as of 2019-04-18 10:17:02 GMT) Product prices and availability are accurate as of the date/time indicated and are subject to change. Any price and availability information displayed on Amazon.com at the time of purchase will apply to the purchase of this product. H300 Features: -Retractable handle.-Two-deck playing card wells (cards not included). 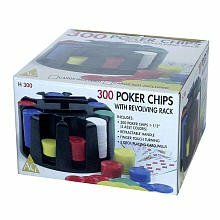 Color/Finish: -300 plastic poker chips in five assorted colors.